Our camps are one week long, and each class lasts six hours. We offer different classes for children of all ages to ensure that everyone is learning something engaging and age-appropriate. During the week, kids will work in small groups. Our teachers will lead the groups in guided STEM-related building projects. During STEM builds, kids will experience the engineering process. This includes designing, building, testing, and modifying their creations. They’ll encounter obstacles and have to think critically to overcome them with their builds. Our dedicated teachers are there every step of the way, helping kids discover their passion. Each day of camp offers something new and exciting. By the end of the week, your child will have participated in a range of activities that stimulate creativity and a passion for discovery and exploration of the world around them! Each of our LEGO building projects encourages creativity and teamwork. Our classes range from structured group builds to free building time. By the end of the week, we’ll have done a little bit of everything! Amusement Park Thrill Rides, Ages 4-5, 9:00 A.M. to 12:00 P.M.
Channel your inner Master Builder and create your very own Lego amusement park thrill rides where everything is awesome! 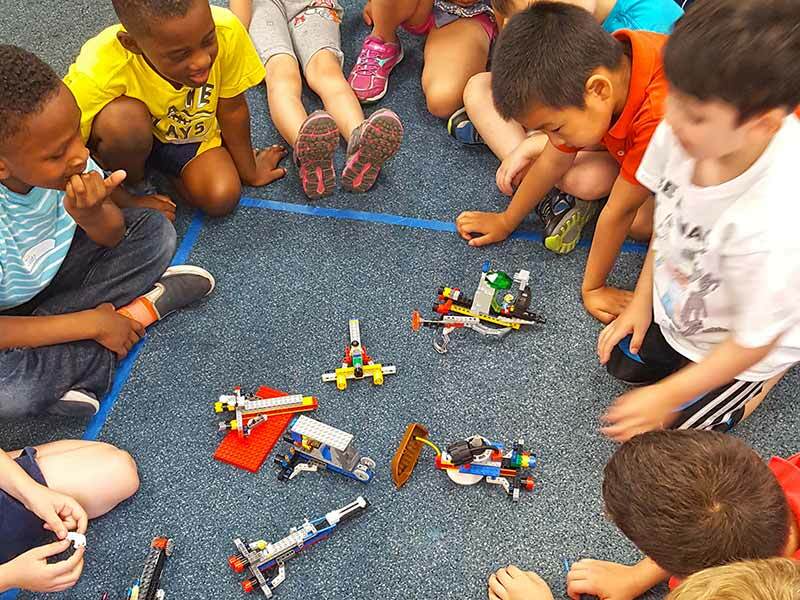 Build some amazing amusement park thrill rides with motors and gears. Students will build: Merry Go Rounds, Taco Tuesday Spinners, Tilt A Whirl and many more.